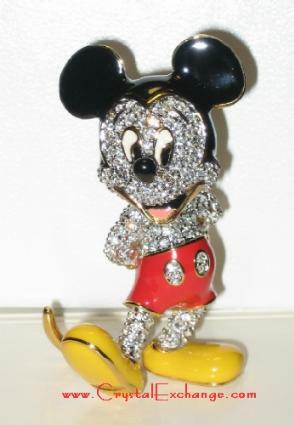 The Swarovski Mickey Mouse was a limited edition figurine sold and marketed by the Arribas Brothers stores in the Disney theme parks. 10,000 limited edition Swarovski statues were produced for the Arribas Brothers. This collectible figure is 2.25″ tall and has over 180 Swarovski paves stones set into the face, arms, chest, buttons and legs of Mickey Mouse. Mickey Mouse features the Arribas stamp in the foot of the figurine. The Arribas Mickey Mouse originally retailed for $295 when it launched and sold out in 1997. While the figurine itself is not numbered, the accompanying certificate does indicate the production number. An optional stand and plaque were offered with the figurine at approximately $50 each. The Swarovski Mickey Mouse was the first piece in the joint venture between Swarovski and the Arribas Brothers stores. Following the success of this figurine, other similarly-decorated, limited edition, figurines were produced: Tinker Bell, Minnie Mouse, Winnie the Pooh, Donald Duck, and there are others. Arribas continues to introduce and sell figurines decorated with Swarovski crystal stones, however, they don’t seem to be quite as popular as the inaugural Mickey Mouse. If you are looking for retired Swarovski Arribas and Disney figurines, Crystal Exchange America has a selection of them. The Crystal Exchange America web site is at www.crystalexchange.com. They have figurines dating back to the 1997 introductions and limited edition Disney crystal pieces. I recently came across a review of some unique watches decorated with Swarovski crystal stones. After reading the review, I decided to get more information on the watches. These retro digital watches can be found on the Phosphor web site. I saw about six watches available, with the primary difference being the strap color and crystal colors. The prices range from $200 – $250 per watch. The basic “time” mode features a 12-hour display, with the hours positioned above the minutes on the face. The watch face also offers a “seconds” mode and “off” mode, showing an entire face of crystals with no time display. These Swarovski crystal decorated watches are interesting. They contain lots of bling and are likely fascinating conversation pieces. While composing this article, I decided to check out the crystal giant’s web site of their product line of Swarovski Watches. As you would expect, the watches are pricey. The least expensive Swarovski watch was $500. I did find several over $3000. If cost is a motivating factor in purchasing a blingy watch, perhaps these Phosphor time pieces may be something to consider! Swarovski Tinker Bell (LE 2008), step aside and make room for Swarovski Tinker Bell (2011). Tinker Bell (2011) is available for purchase at the Swarovski web site, and this is great news for Swarovski fanatics and Disney fanatics alike. This new pair of Swarovski Disney characters of Tinker Bell and Peter Pan retail for $300 each. There is also a title plaque ($55), in the shape of a star, for the duo. The identification number for Swarovski Tinker Bell is 1073747. The identification number for Swarovski Peter Pan is 1077772. While the pictures at the Swarovski web site make this Tinker Bell figurine look rather cute, I do have concerns as to the effects that this new release will have on the value of the Swarovski Limited Edition Tinker Bell that was sold in 2008. Retail price… $300 in 2008 (included title plaque). $300 in 2011. Height…4 13/16″ in 2008. 5 1/8″ in 2011. Wings… Aurore Boreale in 2008. Crystal Blue Aurore Boreale in 2011. Base….Clear, resembling a waterlily candleholder in 2008. Matte crystal in 2011. Outfit….Clear in 2008. Green Olivine Crystal in 2011. Since there are now two Swarovski Tinker Bell figurines, Swarovski crystal collectors and Disney collectors have choices when purchasing Tinker Bell. 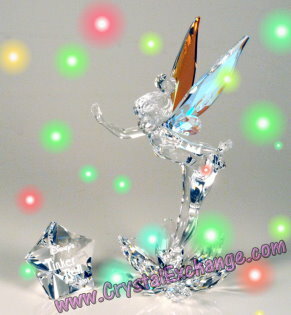 Collectors should use care if purchasing the 2008 LE Swarovski Tinker Bell. As there are a number of similarities, the most obvious stand-out feature is the green dress for the 2011 figurine. Be aware of the differences so that you don’t pay a ‘2008 LE’ price tag for a 2011 figurine with a Peter Pan plaque included. 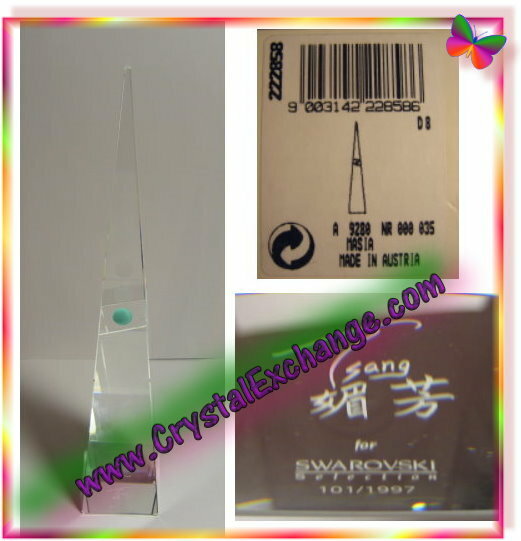 The Swarovski Hong Kong Pyramid is an exceptional sculpture that was in the Swarovski Crystal Home Accessories product line. The Swarovski crystal figurine that sold in January had a price tag of $900 with shipping cost included. Are you curious to know how rare or hard-to-find that it may be? Swarovski produced only 1997 of them from 1997 to 1998. Each of the Hong Kong Pyramids produced is numbered, that that makes this sculpture a Swarovski Numbered Limited Edition (Swarovski NLE). 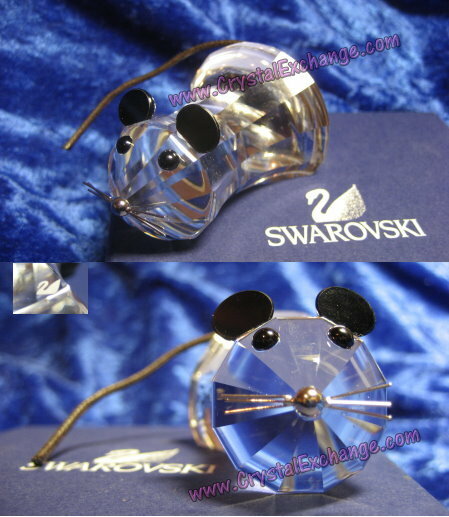 The original MSRP of the Swarovski crystal figurine was approximately $1100 USD. The designer who created the unique sculpture wasTsang Mei Fong. The designer’s design was a competition winner, where her crystal figurine was selected to commemorate the transition year of Hong Kong. The Swarovski Part number is 9280 000 035. The Swarovski system number is 222 858. This magnificent art object measures 12″ in height and 2″ square at the base. This rare Swarovski crystal is not necessarily hard to find, despite the limited number of production. 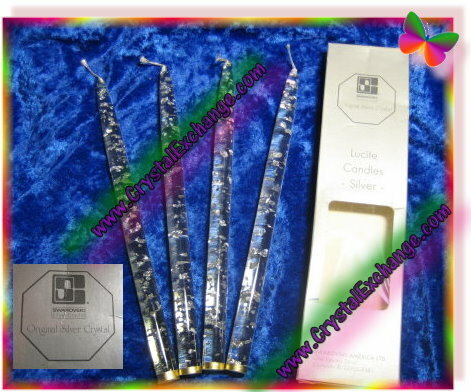 Crystal Exchange America presently has 4 listed, ranging in price from $1700 – $2100. One or two can generally be found in the online auctions near $1200 – $1500. My advice to Swarovski collectors is to purchase the Swarovski crystal figurines that you really like….ones that tug at your heart. One never knows what is going to happen in the economy or how well a figurine may sell to make it more desirable or sell for a much higher price in the future. If this were predictable, we would all be making good investments in crystal and in other market areas. The Black Panther, Swarovski NLE 2010, sold out very quickly when it was released for online purchasing in April last year. With a retail price tag of $960, the Swarovski Black Panther (jet was the official color) was one of the most affordable NLE issues that was produced by the crystal giant. And a maximum production quantity of only 500 figurines, this was another nice feature that made this black cat quite desirable. Shortly after the sell-out date, the Swarovski Black Panther sky-rocketed to its current secondary market price of $2500-$3000 USD. All this being said, the Swarovski Black Panther may have some competition in the very near future. 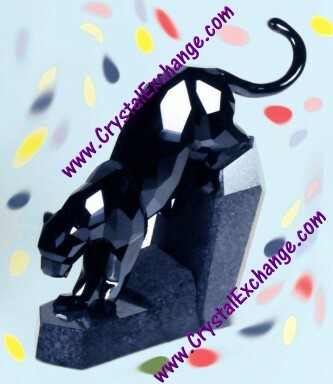 The crystal brand is releasing another colored panther…the Swarovski Moroda Panther. The Swarovski system number is 1096051. Looking at the product picture at the Swarovski web site, you may very well think that this newest panther is brown, which would indeed make it a bit different from the original Black Panther. However, if you look at another new release, the Swarovski French Angelfish, this release has a lot of ‘moroda’ colored crystal accents, and the official Swarovski product description for the fish states that Moroda is black. BLACK? BLACK! Well, of course any color differentiation cannot be done until a collector has both Swarovski Panther figurines side by side. But at the moment, I am feeling uneasy about this new release. My NLE Swarovski Black Panther has gone up in value…something that cannot be said very often these days. If this new cat, the Moroda Panther, is a shade of black, history indicates that the (jet) Black Panther values will drop as many collectors will likely settle for purchasing the Moroda Panther for a fraction of the price. I have seen this new-similar-design approach in the past, and it nearly always brings down the value of the original design as buyers will simply not pay higher prices for retired figurines when Swarovski has other cheaper, suitable alternatives. Examples of this phenomenon include: Swarovski SCS Dragon (DO1X971) and Dragon (7550 000 005), Swarovski SCS Turtledoves (DO1X891) and Turtledoves (7621 000 011), Swarovski SCS Dolphins (DO1X901) and Dolphin (7644 000 001). (and there are other look-alike figurines, these are only a few). All the Swarovski SCS crystal figurines dropped hundreds of dollars, 30% – 50%, depending on the figurine. While the economy certainly contributes to the decline in value of the secondary market in general, I do believe that for these figurines, it was precipitated by the release of the similar-looking figurines which, by the way, are all still current on the Swarovski web site. I foresee history repeating itself…good for the company with more sales of a newly-released panther, no-so-good for collectors who have valuable retired Swarovski figurines, in this case, the beautiful (jet) Black Panther. If you like the Swarovski Panther design, but prefer clear crystal figurines, the crystal brand does offer the figurine in clear crystal, but it is retiring very soon (2011). The clear cat has a system number of 874 337. The Swarovski designer credited for the elegant design is Heinz Tabertshofer. All the Swarovski Panther figurines come in a firm blue box, a cleaning cloth, and gloves. All retail(ed) for $960. If you are a feline fanatic, you may be interested to know that there are other Swarovski crystal wild cat figurines: Swarovski Leopard, Swarovski Lion, Swarovski Golden Shadow Lion, and Swarovski Tiger. Most of these can be found at the Crystal Exchange America web site: http://www.crystalexchange.com/ . Rare Swarovski Violins? FUSE? What? I had never heard of FUSE, Ben Lee, Linzi Stoppard, and nor did I know anything about Swarovski violins until a few days ago. I was intrigued and thought I would share what I found with my fellow Swarovski friends. FUSE is a string group, based out of the UK. They formed their group in 2007. The group leaders are Ben Lee and Linzi Stoppard. These are unique musicians…. They play the ‘electric violins’. Woa…but not just any electric violin (I didn’t even know such a thing existed), they play Swarovski crystalencrusted violins, decorated with over 50,000 Swarovski crystals each. And if that doesn’t sound incredible enough, these violins are not ‘museum display units’, they are really used during the FUSE performances. Each electric violin is insured for £1.0M each. Their tour in 2010 was sponsored exclusively by Swarovski, so they have been blessed. Additional FUSE information is available at Squidoo and the Electric String Quartet web site. I am fascinated, not just with the Swarovski violins, but also with the style. I would definitely try to attend a show if they were anywhere near Ohio. Swarovski fanatics are excited to know that the Swarovski Lovlots Circus figures launched today! The eight new Swarovski Lovlots can now be purchased at the Swarovski web site. As to be expected from a circus atmosphere, the coloring of the Swarovski Circus Lovlots is exhilarating. These figurines use new colors that I have not previously seen in Swarovski figurines. Of course I am saying this based on the product descriptions and pictures on the Swarovski site (since I cannot possible have them in my hands yet). The Swarovski Lovlots Circus is the 4th series of delightful Lovlots figurines. The other Swarovski Lovlots series include: Swarovski City Park (launched in 2010), Swarovski House of Cats (launched in 2009), and Swarovski Gang of Dogs (launched in 2008). 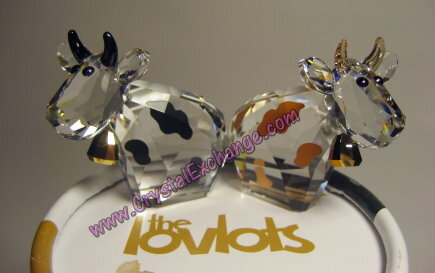 Another “unofficial series” are the Lovlots Pioneers (launched in 2006) which are initial group of Lovlots figurines. 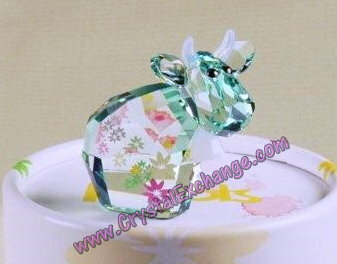 If your Swarovski collection is missing a retired Swarovski Lovlots crystal figurine, Crystal Exchange America has a variety on their web site. They have figurines from all four series in addition to the special limited edition Lovlots. It appears that Swarovski has another Hare / Rabbit / Bunny soon to be released. This Swarovski Hare is made of Crystal Golden Shadow with jet crystal eyes. I believe it is the same design as the upcoming Swarovski Limited Edition Hare, but in a different color. The Swarovski Hare (golden shadow) is about 1.5″ in length and will retail for $60 US. I found stores accepting pre-orders for this item, and it seems that they should be available near the end of March, which is just before the Swarovski Limited Edition Hareis to launch. Many of these retired Swarovski rabbit / hare / bunny designs can be found at the Crystal Exchange America web site http://www.crystalexchange.com/ . At the site, use the search feature, keyword “rabbit”. Swarovski makes a number of beautiful candleholders in their Swarovski Silver Crystal and Swarovski Home Accessories product lines. Swarovski candle holders look lovely on tables and in crystal display cabinets. However, I can tell you that burning candles in them is not something I would recommend. Cleaning wax from any candle holder can be a job, but cleaning wax from a Swarovski crystal candle holder is a real challenge. The simplest way to remove wax from candle holders is to heat the wax and removed it in a softer or more fluid state. But, heating a Swarovski candle holder has a good bit of risk….excess heat can dissolve the glue holding the crystal components together. Putting in it the dishwasher…..absolutely not! Putting it in the microwave….I just don’t think so. Using a hair dryer….I personally would not take the chance. Swarovski crystal collectors may choose to simply display them with a candle. At one point in time, the crystal brand produced some lovely Swarovski Lucite candles. The authentic Swarovski Lucite candles are clear with silver-colored or gold-colored flakes inside. (Obviously, the Lucite candles should not be burned). 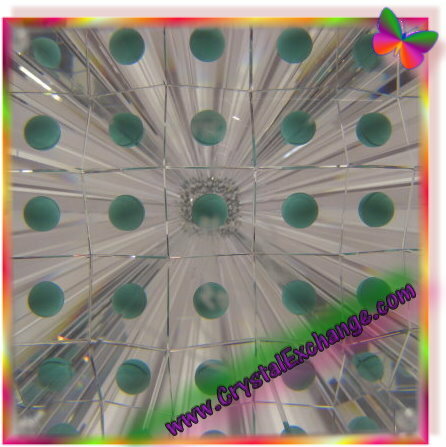 Crystal Exchange America recently sold a set of the Swarovski Lucite candles. The candles were packaged as a set of four. They were clear with the silver-colored flakes. The Swarovski box shows the older Swarovski logo, along with the candle holders that the Swarovski candles would fit into. Crystal Exchange America has a couple more authentic Swarovski Lucite candle sets still available as well as a couple of authentic Swarovski wax candle sets. Swarovski collectors interested in authentic Swarovski candles can visit the Crystal Exchange America site, then search on the term ‘candles’. Swarovski has made its official announcement to SCS members about the Swarovski Limited Edition Hare. The company informs its Swarovski Club members that the limited edition hare will be available in the Swarovski Online shop only (this means not at store retailers or boutiques). The planned launch date is April 11, 2011. The Swarovski Limited Edition Hareappears to be made of smokey quartz (gray) crystal. Swarovski does not mention size, price, or quantity produced in its online announcement. They do mention that the Swarovski limited edition hare is a global release, so I take it that there are no exclusions as to who can purchase it (sometimes online-only releases are limited to specific countries). If you are looking for Retired Swarovski Rabbit figurines, many can be found at the Crystal Exchange America web site. I believe that all the retired Swarovski crystal rabbits are clear crystal figurines.